How parts are handled during cleaning operations generally fall under two types of definitions: continuous individual product flow or batches of individual parts contained together constituting a 'load'. In-line equipments are those that process product in a relatively continuous, uninterrupted product flow generally of individual parts. Continuous flow present unique problems including speed, layout and orientation factors to name a couple. The limited amount of time to scrub, rinse and dry the part causes floor space and handling concerns. Conversely, being able to do cleaning inline allows users flexibility in production. Product flow can be integral to manufacturing production as an extension of a previous, or a following, manufacturing step or it can be a separate off line system for cleaning or processing. Indirectly, continuous product flow can reduce WIP and material handling. W3 has unique and innovative products and experience in these applications and machines for many years. Batch processing machines process product in discrete loads, or batches. These can be an individual larger part or a collection of smaller parts. Batch handling has traditionally been more common but new manufacturing methods and demands have made innovation to cleaning necessary. The demands to produce more and faster part loads can force major manufacturing line changes, like continuous inline product flow. But that major of a production change does not have to happen with W3. W3ís innovative machines and ultrasonic power makes batch processing viable to higher requirements. Here you will see a representative array of the industries W3 Ultrasonics can serve. If it looks like any industry could be in this list, you are correct. W3 has experience in virtually every industry. The reason is because W3 ultrasonic equipment is powerful enough to address the toughest "dirty cleaning" application, yet fast enough to address the lightest "clean cleaning" application. Continuous Apps - High speed and often tenacious contaminates create little time to clean product within limited floor space but W3 high power Surround products are specifically designed for all wire industry products. See Surround or Continuous In-Line. Batch Apps - Strips of welding wire in bundles creates a nest that requires high power to penetrate to scrub and rinse and dry but W3 has tanks systems to do the job. See Surround. Continuous Apps - Similar to wire except the wider cross section requires a Shallow Bath machine configuration operates on the same principal as conventional W3 wire cleaning machines. See Surround. Batch Apps - Discrete lengths are often long and cumbersome but W3 automatic lift machines move product in the correct orientation through the cleaning process. See Consoles or MCMS. Continuous Apps - High volume and continuous product flow, often with excessive lubricants, present a handling problem but W3 machines can take parts individually and immediately off the machine, process and deposit into totes or downstream conveyance for further manufacturing operations. Batch Apps - Many smaller parts batches together present a particularly nasty problem called nesting. Nested parts are hard to penetrate with either fresh solution or sufficient scrubbing action. W3 Ultrasonic power is extremely high and can penetrate nests that others cannot. Surround products offer a unique options for users but also, the extensive variety of W3 material handling and automation machines makes many choices available for users. Batch Apps - Whether complete or partial assemblies or individual parts, these are usually batch type applications. Assemblies or groups of parts to a unique assembly create problems because of the masking of one part over another. 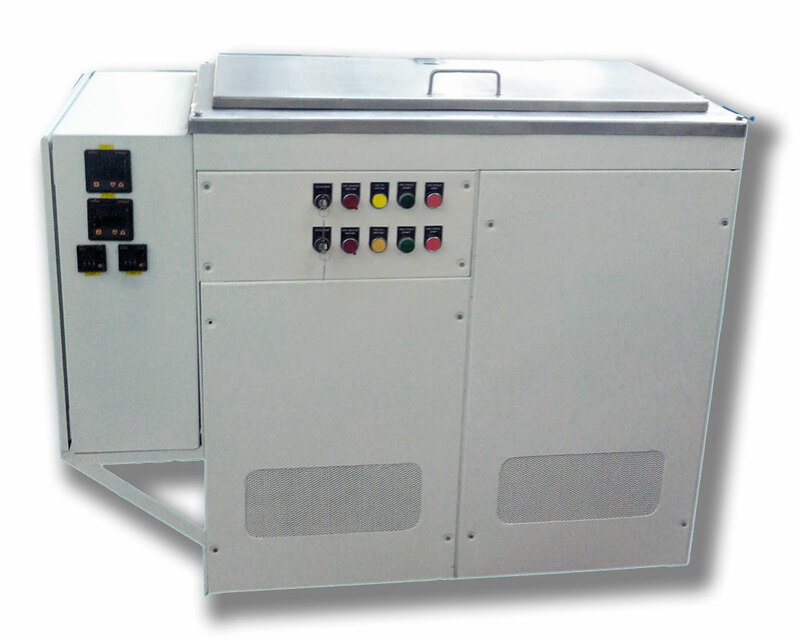 High power overcomes that without having to reposition the parts or reduce the assembly mass or the part load. W3 has batch consoles to large systems to address the production requirements. See Consoles or MCMS. Batch or Continuous Apps - The main problem here is the complexity of modern machined parts, small and convoluted through holes and small blind holes. These must be filled with solution, scrubbed, emptied and refilled again for repeated cycles of wash, rinse and then drying. High power W3 ultrasonics not only make the process feasible but much faster than other methods. Material handling options are also available with both batch and continuous product flows. See SCMS, or MCMS or Continuous In-line. Batch Apps - Almost, but not always, these are batch processes and require product to transfer from immersion chamber to immersion chamber and often many process stages. W3 has an extensive array of machines and automation to fit the bill. See MCMS. Batch Apps - These can cover a wide assortment of shapes, sizes, material composition, complete and partial assemblies and individual parts and are generally batch type applications. Interestingly, these application often pose the greatest of problems because the types and combinations of contaminants can be quite different with each part. Additionally, the amount of contaminant varies from part to part depending on its use. Again, high power and proper equipment configuration make the machine versatile for the myriad of uses it will encounter. Ancillary filtration, oil coalescing or skimming and chemistry selection is also important to deal with the varied contaminants. See Consoles or MCMS or SCMS. Batch and Continuous Apps - Critical surfaces and finishes are important here. Whether its individual parts before assembly, completed assemblies or assemblies requiring maintenance cleaning, they must be scrubbed, rinsed and dried thoroughly and quickly to retain all critical tolerances. A common misapplication is to apply low power and a long exposure time but that can actually erode critical surfaces. Ironically, high power for a short exposure time is the key and the method W3 employs in these applications. See SCMS or MCMS or Continuous In-Line. Batch Apps - Usually a batch application but not always, the problems are small diameter through holes and blind holes. These must be filled, emptied and rinsed of solution with each process stage. A problem for parts cleaned repeatedly, as in a maintenance situation, is often the buildup of hard to remove contaminants like carbon. High power W3 single chamber, multi process systems are ideal for these applications. See SCMS. Batch Apps - The main problem here is similar to highly machined parts which is small and convoluted through holes and small blind holes. These must be filled with solution, scrubbed, emptied and refilled again for repeated cycles of wash, rinse and then drying. High power W3 ultrasonics can penetrate the part without damage to scrub the interior passages and much faster than other methods. Material handling options are also available with both batch and continuous product flows. See SCMS or MCMS. In addition to traditional Industrial Parts Cleaning machines and equipment, W3 has supplied equipment and systems to solve non parts cleaning applications. Non parts cleaning applications are those where a userís solution or material requires modification into a different composition or to exhibit a different characteristic than the current state. contact W3 directly to discuss. Again we refer to over 100 man years of combined experience in applying the highest ultrasonic cavitation energy in a solution. Remarkable results can be achieved with high power ultrasound energy intelligently applied by experienced personnel.